Through a special arrangement with Lexar, DriveSavers is authorized and recommended to perform data recovery on Lexar digital cameras and memory cards at reduced rates. Our work will not void your original warranty. We are also extending Lexar customers some very special benefits. DriveSavers engineers have the in-depth knowledge and technical expertise that comes from over 30 years of data recovery experience, allowing us to achieve the highest success rate in the industry. We routinely rescue lost databases, photos, music libraries, ERP accounting systems, mail servers and other mission-critical data for individuals and organizations of all sizes. 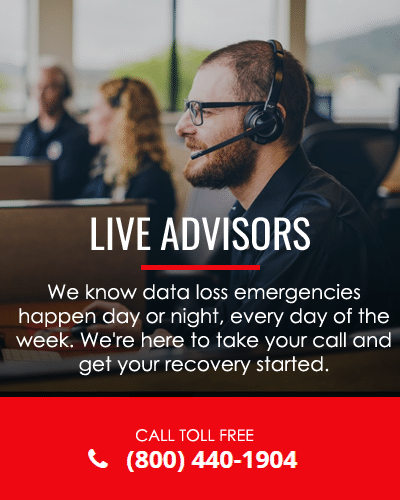 As the leader in the industry, we consistently recover data that other service providers have deemed lost forever. Any hard drive opened in a non-Cleanroom environment will be contaminated IMMEDIATELY. One small dust particle can cause permanent damage to media platters, which CANNOT be reversed. Most data recovery companies do not have an ISO Class 5 Cleanroom! DriveSavers performs all data recoveries in a Certified ISO Class 5 Cleanroom environment with highly-filtered air containing no more than 100,000 particles greater than .1 micron in size per cubic meter to maximize the opportunity for a safe and successful recovery. This controlled environment (laboratory) is 10,000 times cleaner than a typical room (non-controlled environment), which can have as many as 1 billion particles of this size per cubic meter. DriveSavers engineers are trained and certified by all leading encryption vendors. Don’t be fooled by online appearances or promises made by other data recovery firms. DriveSavers is the only company in the world that has received ISO Class 5 Cleanroom, encryption, network and SOC 2 Type II certifications, making us the fastest, most secure and most reliable data recovery service in the world—guaranteed. View all of our certifications. Use of DriveSavers as a data recovery company is at the sole discretion of the customer. Lexar assumes no liability for any loss or damages of any kind that relate to, arise out of or result from the performance of services by DriveSavers, including, but not limited to any loss of data contained on a Lexar product. We've helped hundreds of thousands of customers recover lost data. Your data is safe at DriveSavers. Annual audits and inspections from independent third-parties confirm we are the most secure data recovery company in the industry. DriveSavers invested over $2 million to build the world's most advanced Cleanroom, and meet manufacturer standards. This dust and static free environment helps us maintain the highest success rate in the industry. We're recommended and authorized by the world's leading storage and computer manufacturers. Our work will never compromise your warranty coverage. Only DriveSavers can make this guarantee. Every DriveSavers employee is dedicated to the complete satisfaction of our customers. Call us day or night and experience our exemplary customer service and superior expertise. In the virtual world of the web, other data recovery companies might appear to be just as qualified as DriveSavers. They claim to provide the same levels of experience, service and security. But, can they really support what they say? To confidently select a reputable data recovery firm, ask for proof that they can meet and uphold these industry standards. Android and iPhone Data Recovery: What’s Happening to 23% of Smartphones? © 2019 DriveSavers Data Recovery - All Rights Reserved. No part of this website or its contents may be used or reproduced without DriveSavers express permission. DriveSavers, the Life Ring symbol and the phrase “We can save it,” are registered trademarks of DriveSavers, Inc. All other trademarks are the property of their respective owners.